Burke County is located east of Asheville, the county seat is Morganton. With a population of 90,912 people, Burke County is a fairly decent sized county. Burke was first settled by the Spanish in 1567, but Indian attacks eviscerated their colony and Europeans made no attempt to settle the area until 200 years later. The county was established in 1777, at this time it encompassed most of western North Carolina, with many counties later being formed from Burke. Those who came later were of Scots-Irish and German stock, they were mostly yeoman farmers and fiercely independent. Only a few families owned slaves. Burke’s population is largely white, which has caused Democrats to struggle here recently as Republicans solidify their hold on majority white, rural counties. Burke gave Romney over 60% of the vote in last year’s election. The economy is built around the agriculture and manufacturing industries. Burke provides substantial forest goods to North Carolina. Textiles once dominated the economy here but their decline has forced Burke into the manufacturing of other goods. Burke votes Republican in federal, state, and legislative elections. The County Commission is also under Republican control. 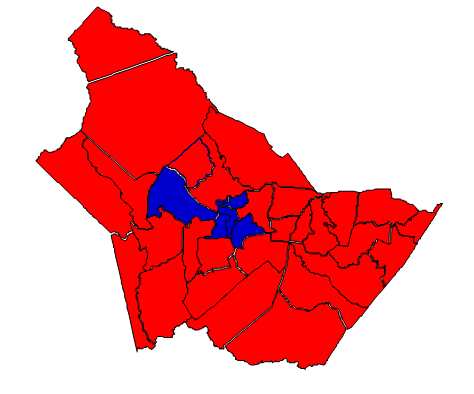 Democrats are strongest in Morganton. The eastern half of the county is a conservative bastion, while the western half is more competitive, with a Republican lean. Forecast: Democrats have never been especially strong in Burke, but they used to do better. The last time Burke went Democrat in a federal race was back in 1998 when the county narrowly went for John Edwards, whose working class message appealed to voters. Many switched over after Clinton’s first term in 1996 and from then on out decided to not give any more chances to Democrats. Democratic support was further eroded here with the nomination of Barack Obama, who was not a good fit for this county or anywhere in this region. If Hillary Clinton is nominated, she will probably hold Republicans under 60% of the vote but even in an overwhelming landslide her chances of victory here are unlikely. The county experienced a lowly 1.98% rate of growth during the 2000s decade. The white population is barely growing at 0.05%, but profound demographic change is unlikely because no other race is growing quickly. Burke has a surprisingly large Asian population, 3.50% as of the 2010 census. But white voters dominate in terms of population and voter registration, and an estimated 2/3rds of them opted for Romney last November. This composition of white, rural, working class voters means Republican victories for the foreseeable future.